josiah is using Smore newsletters to spread the word online. Promises don't float around in the wind. Everybody has to work hard for promises. Joey & Josh have to work for everything just to survive. 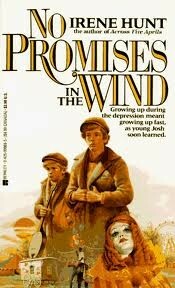 "there were no dreams now, no hopes, no interest, except in finding food enough to keep Joey and me alive". In this quote it shows that they had nothing to think of or work for except finding food just to eat their next meal. They work so hard, but yet they still lose weight because they can't find enough food even with all of they searching they do to find food. Josh fights against himself a lot! He is always debating something in his head (to do or not to do? that is the question). "We're causing him trouble and expense-we're making him worry. I hate to think about that." Josh doesn't want to think about that because whenever he does he always has to decide whether to leave, but he doesn't want to because he isn't sure how his dad will react when he comes home. There are also many other examples of how Josh can't decide to do things and i think he makes the right choice most times. Josh always thinks only about what will keep him and Joey alive. "Here we are starving and you give away food enough to keep us alive for days-" In this quote it shows that josh doesn't care about other people, even if they helped him and Joey. He has the will to survive you could say. Although I think he is also very selfish. Josh & Joey are two very different, but very similar people. Josh blames his dad for everything that goes wrong. " I didn't feel the love for him that mom did." Joey on the other hand doesn't hate his dad he is just scared of him. He tries to be nice and help his dad but his dad just gets mad at him, even though joey keeps trying.